When tourists go sightseeing in south east asia, you must bring a gift in the form of local production of coffee. Let’s talk about the vietnamese coffee, but because coffee is a mainstay of the country’s income and also has become part of the lifestyle of the locals. Since the early 20th century, coffee production has become a Vietnam major commodity. Coffee production in the country made by France in 1857 and developed into the country’s economic levers. 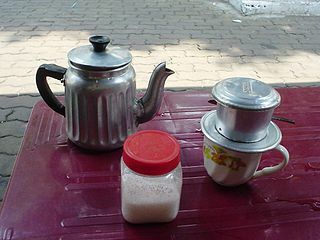 Coffee production had faltered during the vietnam war, but re-surged during the Doi Moi economic reforms, to reach 900 000 tonnes per year in 2000. In 2009, Reuters reported that approximately 1.13 million tons of Vietnamese coffee is exported abroad. Thus, coffee is the second largest export commodity after rice. Since its introduction by the French in the mid-19th century, Vietnam is slowly becoming a coffee producer in Asia. The first instant coffee factory, Coronel Coffee Plant, established in Bien Hoa, Dong Nai Province, in 1969. Since the Doi Moi reforms in 1986, the establishment of private companies were allowed back resulting in significant growth in the industry. At this time appeared a new coffee plantation companies such as Highlands Coffee and Trung Nguyen. Until now, both companies are still a major producer of coffee in Vietnam. Coffee producing areas in Vietnam is Gia Lia, Dak Lak, Lam Dong, Kontum, Dong Nai, Ban, Vung Tau, Ba Ria, and Binh Phuoc. Vietnam and southeast asia topography suitable for coffee plantation. The hills in Vietnam has the perfect height for growing coffee plants. Vietnam has six species and varieties of coffee, such as Sparrow, Se Arabica, Robusta, Liberica, Excelsa, Catimor, and Chari. That makes Vietnam unique coffee is very complex topography of the plateau Annam and create micro-climate in the area. It has been recognized more than a century ago and that condition has been exploited to diversify crops. There are two general approaches of the coffee, which is a mixture and a single. In Southeast Asia with different varieties of coffee, coffee mix is something that is common. Mixing some species can produce a variety of coffee flavor with an incredible aroma. In Vietnam, coffee mix is preferred over a variety of coffee beans. Vietnam coffee beans roasted in butter oil, which sometimes does oil of butter, but sometimes only use vegetable oil. Traditionally roasting will produce a kind of caramel that surrounds the beans because it uses sugar, chocolate, vanilla, and oil. The use of vanilla and chocolate made to mask the bitterness of the raw coffee beans are not accidentally come taken. However, modern methods no longer do this because the caramelization process only picking ripe coffee beans. One of the most unique is brewing techniques. Coffee brewing technique is different in different places. In Italy, the use of mocha express are common. In Aceh, the coffee is filtered several times with fabric to ensure consistency and texture proper coffee. In Vietnam, the most common way tends to use a metal filter called a phin. This method is also commonly found in Cambodia, Laos, and Thailand. According to information, the use phin originated from Cambodia in 1800. Milled coffee beans that have been placed on the inside phin, after it was closed by the filter. Then you pour hot water on the filter. The coffee will drip on the glasses you put under phin. Usually coffee drink with mix condensed milk and ice.